A memorial fund has been created in the late Professor Richard Wise’s name to commemorate his contribution to science and the academic community at Imperial College London. 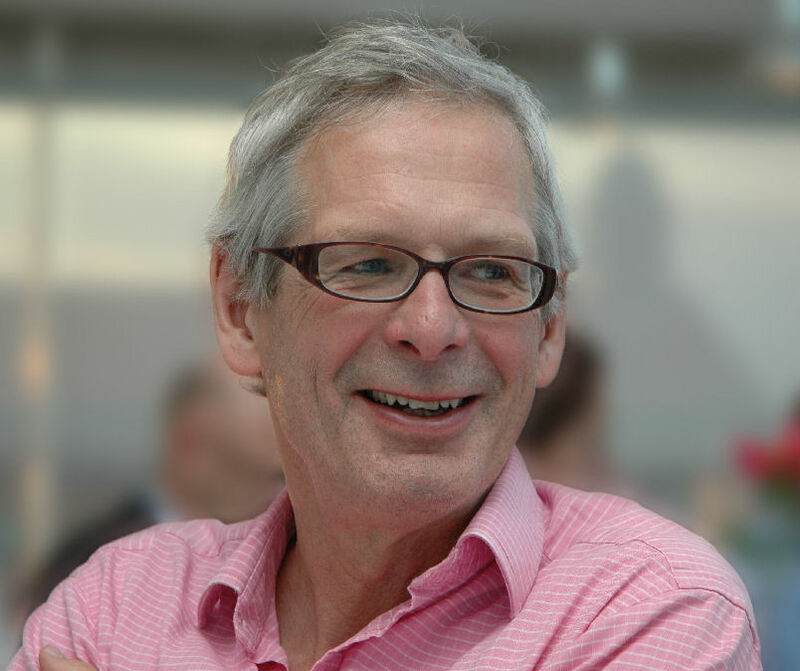 The Professor Richard Wise Memorial Fund exists within Imperial College and aims to commemorate Richard and his passion for supporting researchers early in their careers. The Computational, Cognitive and Clinical Neuroimaging group at Imperial to will be hosting an annual international lecture prize competition for young scientists in cognitive neuroscience. This will be in memory of Richard who made enormous contributions to cognitive neuroscience and had a reputation for supporting young neuroscientists. Early to mid-career neuroscientists will be invited to submit scientific abstracts in the field of cognitive neuroscience on an annual basis. The winning candidate will present their work in London alongside an invited lecture delivered by a senior internationally-renowned cognitive neuroscientist. The fund will support travel expenses for both the winning scientists and the invited speaker, their accommodation costs, and refreshments for the event. To maximise attendance to the event, the event itself will be free and open to all cognitive neuroscientists and will be temporally linked to a national/international neuroscience event, such as the annual Association of British Neurologists meeting, or the British Neuropsychological Society spring meeting. Around 200 delegates are expected, from a wide range of research and clinical backgrounds. The audience will include clinical neurologists, neuroscientists, neuroimaging analysts and clinical psychologists. The organising committee will be chaired by Professor David Sharp, Dr Adam Hampshire, Dr Fatemeh Geranmayeh and Dr Emily Shaw (Richard’s daughter). Donations to the Fund can be made on the JustGiving page. Professor Richard Wise was a Consultant neurologist and a Professor of neurology at Imperial College London. He was a prolific academic writer who was deeply respected by his colleagues and patients. He supervised many PhD students who have gone on to become leaders in their field. ICCESS have once again been supporting the More Smiles Appeal, by delivering a simulation event at Wetherby Preparatory School on 2nd February 2016. Funds raised on the night will contribute towards the redevelopment and expansion of the paediatric intensive care unit at St Mary’s Hospital. The simulation featured a team of clinicians from the unit demonstrating the high level of care they provide despite the constraints they are placed under in terms of space. ICCESS are pioneers of Sequential Simulation, which is the physical re-enactment of a patients care pathway through the healthcare system. It utilises real clinicians and clinical props to provide expertise and context to the issues being explored. ICCESS’ Sharon-Marie Weldon, who has developed the concept and successfully designed and delivered numerous simulation events, has seen first-hand how Sequential Simulation serves as a valuable means of engaging people with the world of medicine: ‘Sequential Simulation is a way of utilising the benefits of simulation to recreate aspects of care, but with a much wider scope, creating a juxtaposition of the healthcare system that can be used for a variety of objectives; education and training, evaluation, care re-design, quality improvement, and patient and public engagement – as we saw with the More Smiles Appeal event’. In November 2016, Professor Roger Kneebone was invited to participate in a 2-day colloquium in Bern, convened by the Swiss Federal Office of Public Health (FOPH) to formulate a national strategy for skills and simulation in health care in Switzerland. 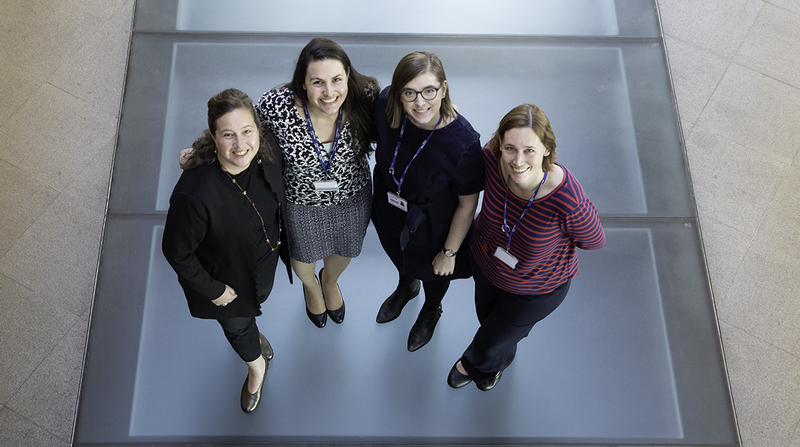 The colloquium brought together the University of Bern, the University of Applied Sciences Bern, the University of Health Sciences of the Canton of Vaud (HESAV), and the Bern Centre of Higher Education of Nursing. As one of two invited international experts, Roger presented his perspective on simulation and health policy within the UK and internationally. 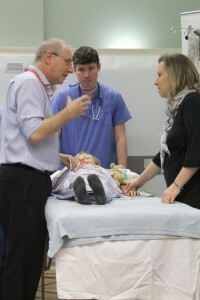 This included research on hybrid, distributed and sequential simulation within Imperial’s Centre for Engagement and Simulation Science – work which has now become embedded in the curriculum of the Bern Centre of Higher Education of Nursing. Clinical Research Fellow Laura Coates was recently invited to be a visiting speaker at the University of Alberta in Edmonton. Laura gave an hour-long Grand Round presentation to the whole of the surgical department, followed by meetings with a number of members of staff and a session with the University’s postgraduate surgical students. Laura talked about some of ICCESS’ public engagement work, including events focusing on the effects of knife crime and the recent Time Travelling Operating Theatre that featured in last month’s FoM newsletter. Laura’s visit was very well-received, with staff and students commenting on the interesting and unusual nature of ICCESS’ work. Two of ICCESS’ students, Alejandro Granados-Martinez and Przemyslaw Korzeniowski, have successfully defended their PhDs on consecutive days. Their respective work on ‘Modelling and Simulation of Flexible Instruments for Minimally Invasive Surgical Training in Virtual Reality’ and ‘Haptics-based Simulation Tools for Teaching and Learning Digital Rectal Examinations’ was highly praised by the examiners, with only very minor corrections to be made to their dissertations. The CRUK Imperial Centre has been hosting a series of bake sales, with teams competing to raise the most money for their chosen charity. We’ve seen some fantastic bakes that would make Mary Berry proud; including chromosome cupcakes and an entire lab cake! 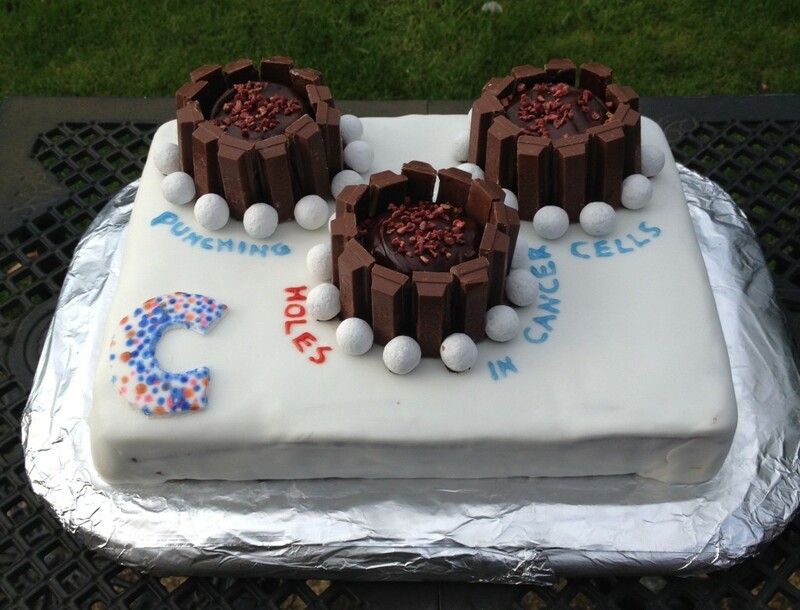 These science cakes will be entered into the national CRUK Centre Great Science Cake Off. The winner of the Centre bake off and science cake off will be announced later this month. Cancer Research UK has commissioned an art installation in an out-patient clinic at Charring Cross Hospital as part of renovation work. The art installation will include ceramic butterflies and flowers demonstrating the symbiotic relationship between research and care, whereby patients receive care while simultaneously giving back to scientific research, allowing us to find newer and kinder treatments. These pieces designed by artist David Marques will create a beautiful meadow, transforming the space for patients. The butterflies, which each represent a patient coming to the clinic, fly over a healing meadow of flowers of different colours and patterns. These flowers represent the various treatment modalities and people patients meet on their care journey. 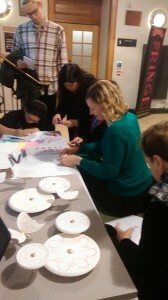 A selection of the ceramic pieces was displayed at the Imperial Design Fringe, and the public got the chance to do their own designs that may go on to be adapted by the artist for his work. The pieces will also be on display at the NCRI conference in November. The installation will be in place by November 2015. We were all very saddened to hear of the passing of Lisa Day on Saturday evening, the 12th of September. Lisa was one of Imperial College London’s Clinical Trials Assistants who worked on the Bioresource study on the Wharfside clinic at the St. Mary’s campus; obtaining consents and blood samples for future HIV studies. In her short time here in the CTC, she contributed so much more than her contracted duties. She was never without a smile; never complained about the nagging issues that Imperial College and the Trust deliver to our daily working lives; never failed to contribute a personal story which made us smile and laugh in equal measures. Nursing has lost a professional it never realised it had. Lisa was very excited to be furthering her education and to be embarking on a career within the profession of nursing at City University. She was due to start her studies this month. We’re trying to raise £2000 to create a nursing student bursary in memory of Lisa because we’d like someone to finish what she never got to; helping those nursing students who may be having some financial difficulty while obtaining their own degree – but in Lisa’s name. I’ve committed myself to raising £1000 as part of the 1000/1000 Challenge (1000 people each raising £1000) for The Hunger Project in 2015 by taking on two tough challenges. In April I’ll live on £5 for 5 days as part of The Hunger Project’s Live Below the Line campaign, and in August I’ve signed up to run/walk 100km (2.5 marathons) from London to Cambridge, which will take me hopefully far less than 24 hours of non-stop running/walking and just a little training! Live Below the Line is a fundraising and campaigning event which challenges people to live below the poverty line for 5 days – the challenge is tough but gives you a unique glimpse into the lives of 1.4 billion people who live below the poverty line every day. The Hunger Project (one of the main charity partners) is building a team of Live Below ambassadors/bloggers/participants to spread the word. If you are interested, get in touch with Mark. Starts – Monday, March 03, 2014. Ends – Sunday, June 29, 2014. Most participants will take the challenge in the MAIN campaign week Monday 28 April to Friday 02 May. An evening concert has been organised on Thursday, 25 July in support of the Imperial College Healthcare Charity. After three weeks of applications and two weeks of auditions, some of the best musicians from Imperial College and Royal Academy of Music have been chosen to perform for you. Tickets are priced at just £10 and include welcome drinks. Additional donations are welcome. All proceeds will be go towards improving the quality of patient care and safety for NHS hospitals. The concert website is available at http://www.ruzannagulakyan.wix.com/musicforthesoul, where you can find out information about the programme, musicians, venue, registrations and more. If you have any questions about the concert, please contact Ruzanna Gulakyan. Sarah Perkins, Head of Research Strategy for the Faculty of Medicine, is taking part in this years Moonwalk on 12 May 2012. She is fundraising for the Walk the Walk breast cancer charity. Alexandra Williams, Dr Shamini Gnani, Dr Adrian Raby and Stephen Platt (all from Department of Primary Care and Public Health) are looking for fellow faculty staff to join their team for the Santa Run on 3 December. Three of the members recently competed in the Run to the Beat half marathon challenge to raise money for charity; the Teenage Cancer Trust and the NSPCC. So far over £1500 has been raised for the two charities. Sponsor Neil Young (Faculty of Medicine Centre) for Movember – raising important funds for men’s health. He hopes to grow a beautiful ‘Rock Star’ moustache.